When Linda Fischer gives a report on whales to Jill Brenner's fifth grade class, Jill's classmate Wendy begins calling Linda by the cruel nickname of Blubber. Soon, everyone in the class is in on the joke, and Jill is dressing as a flenser - one who removes the blubber from dead whales - for Halloween. For weeks afterward, Linda is the target of increasingly mean attacks that are both psychological and physical in nature. Jill never sees anything particularly wrong about her treatment of Linda until she crosses Wendy herself and finds the situation reversed. 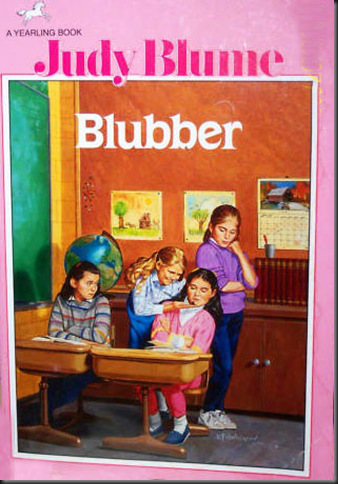 I loved this, along with other Judy Blume book, when I was in school. I really should do a reread of Blubber myself. Blume is very real, and it can be both difficult, and at times too much, like in Forever, but she is a wonderful writer who I think young readers are drawn to because of the reality and how they can relate to them. This book is very difficult to read. I guess it's because "Blubber" is so true to life. How very sad.